Trevor Neil is a Director of RRG Research BV. He is considered Europe’s leading Quantitative/Technical Analysis expert who has spent over 40 years in the financial industry. Trevor began his career as a soft commodity floor trader for Merrill Lynch in 1974. Since then, he has developed his skill as a futures fund manager and professional technical analyst. He has worked on the floor of LIFFE giving short-term technical analysis support for a large group of arbitrageurs in the Bund pit, was a Hedge Fund Manager at T-Capital, and managed a successful futures quoted fund at Union CAL Limited. Trevor served fours years as the celebrated global head of technical analysis at Bloomberg being responsible for training and technical analysis software development on the Bloomberg terminal. 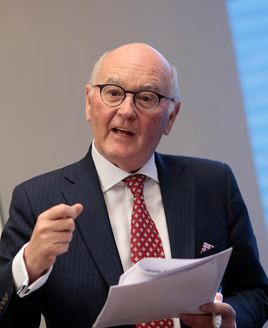 In 2004, Trevor founded the BETA Group – Behavioural Economics and Technical Analysis – which offers consultancy to banks and funds around the world, as well as offering seminars to professionals in the industry. He was a founding board member of The Society of Technical Analysts in the UK and was involved in the creation of the IFTA professional qualification CFTe. Trevor has had several articles published on trading techniques, is a well-known and sought-after teacher of the practical application of market timing skills, and has appeared on CNBC, Bloomberg, IG TV and Core television. He also delivers the popular monthly webinar, Trevor Neil’s Technical Analysis Surgery, which is sponsored by Thomson Reuters. Trevor Neil is from Glasgow, Scotland. He was educated at Gloucester House, then Portora Royal School in Enniskillen, Northern Ireland. Conversations: Podcast Interview with Trevor Neil - Alex Spiroglou sat down with Trevor Neil to discuss his impression of the current market. Trevor also gave us insight into his journey to becoming a technician and shared his thoughts on where the markets will go from here.